A lot of great new changes have happened on Cowper Campus! Over the summer, remodeling work went underway, and we're excited for the entire community to see the new and improved campus! Below are some photos taken during the remodeling process. 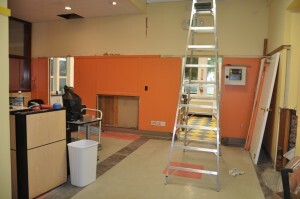 We expect all the renovations to be complete by mid-August. 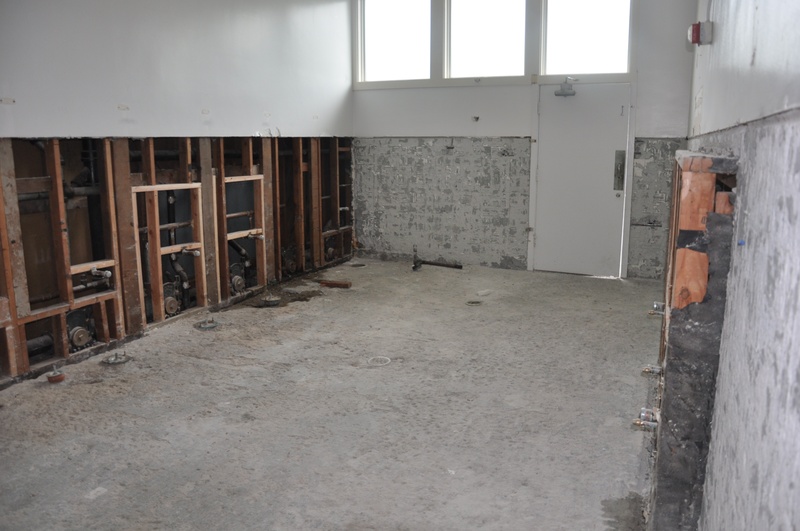 We worked on the Boys' and Girls' bathrooms, added new tile on the walls and floors, as well as new fixtures. There's now also a separate adult bathroom with its own access from the corridor. All of the outside windows have been replaced with double pane, heat and cold resistant glass, and it's already much cooler in the building. 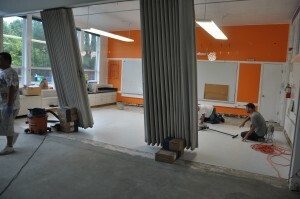 All of the hallways and doors will be repainted, as well as color accents on the rafters above. The classrooms will also be repainted and the carpets were removed from the classrooms and new VCT floor tiles were installed. The reception area will probably the most noticeable change. The entire area is being remodeled, and a new digital display marquee will be installed on the wall, to keep everyone informed of upcoming events and activities. Additionally, a new phone system was added, as well as an upgraded alarm system that extends to the portable building. The playground will be updated, with the blacktop gaining a new 1" topcoat, the tanbark underneath the play structures are going to be replaced with new tanbark, making a softer landing surface, and some of the picnic tables will have awning to cover from weather extremes. The portables will also have awning. Whew! It's certainly a lot of changes to the campus, but it's worthwhile! We are so proud our language immersion Early Years Program, and we hope you enjoy your "new" campus!